Does smoking and diabetes link lead to death? If your do smoke and at the same time are diabetic, this will definitely shorten your life. For sure, they both will anticipate your death and you cannot stop it if you take the right measures in time. If you have the strong willing to say yourself: I’ll continue the smoking cessation therapy and stop other bad habits; sure you will not shorten your precious life so easily. I know that is very hard for you to stop smoking. Even for my father. He has been diagnosed with diabetes 10 years ago and still didn't stop smoking. I felt sorry for him. Smoking together with diabetes have worsened his health condition and several times he has been in ICU. But still he didn’t have the strength to say: "NO" to this dreadful habit. Sometimes I think that these people, who can’t say NO, are not strong enough as men. Although it might be "unpleasant" to say such a thing about your own dad, however even my father didn't succeed to cease smoking; that's why I include him in the "not strong enough men" group. Sorry for saying that. One man, who considers himself a real man, can easily say NO to the cigarette offered or other bad habits. In my country, men who don't smoke and don't drink alcohol, are considered as "women-like". Instead, I consider them "men enough to carry their own responsibilities" they have toward themselves and their beloved ones. Why to live 10 years less, when instead you can live 20 or more years longer? Why to anticipate the diabetes onset, while even if you are among high risk people, you can have the chance not to develop it? Why to enhance insulin resistance, when you can eliminate it and improve insulin function? Why to increase blood sugar levels, when you should lower it? Why to accelerate diabetes complications, while you can avoid them? The above queries need the same decision by you: CEASE SMOKING. 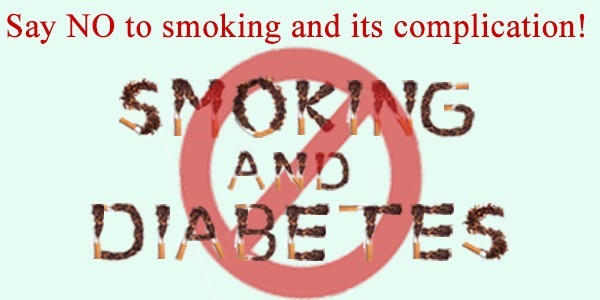 You will not face all the smoking and diabetes worst problems if you decide to do so. I was astonished when I learned that smoking is an avoidable death factors in one out of every five deaths per years in United States. It is bad, but it remains still avoidable. Why not to avoid it? •	More blood will flow in your body tissues. No more deal with heart disease, stroke or death. •	Your blood sugar level will be lower. No more insulin resistance, or hyperinsulinemia. •	No blood vessels will be hardened. 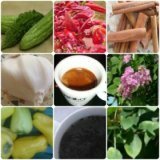 No more worsen leg pain, skin infections, and eye and kidney damages. •	No more impotence, your sexual health will improve. Your overall health will delight. •	You will turn a good educator and a good sample for your child to raise up with no bad habits. You may now realize not to risk anymore and suffer the smoking and diabetes consequences. Don't you think you deserve to live like a human; in a decent way? I'm sure you'll enjoy your life better without smoking than if having a cigar. And of course, you may find solutions to your problems or any other battle in your life without lightening a cigarette. I know you have that huge strength. Don’t be frightened by the early post-cessation anxiety, withdrawal, weight gain. They will stabilize with time. All you have to do is to go on with the right decision. NO MORE SMOKING AND DIABETES COMPLICATIONS.